During the week between the Christmas and New Years holidays, I had planned to take a week-long trip to Death Valley National Park in California. 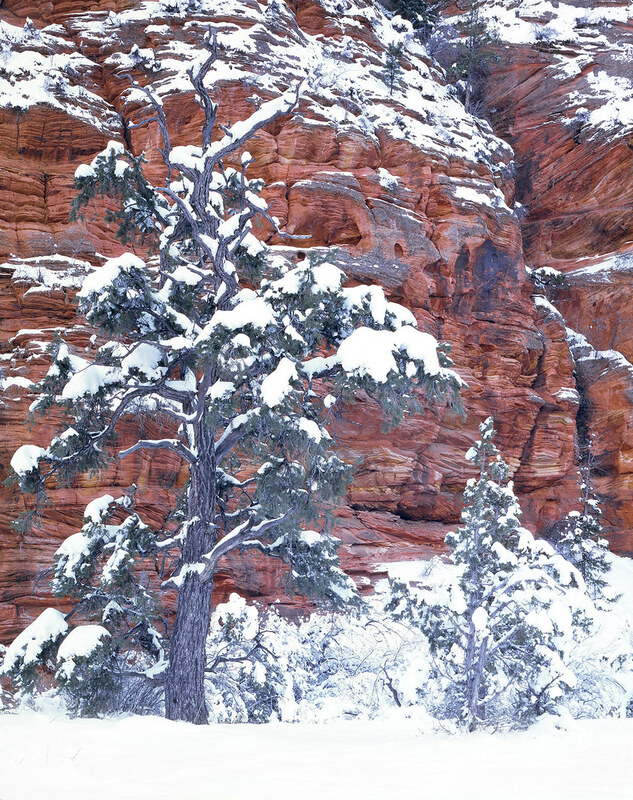 However, in the final days leading up to the trip, Zion National Park experienced a heavy snowstorm that dropped enough snow to make for roughly knee-deep powder in much of the higher elevations of the park. 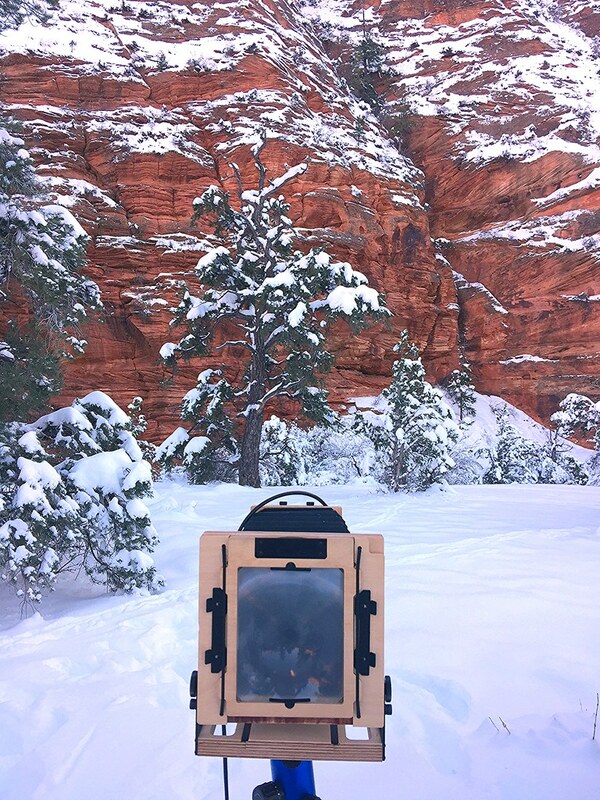 As I’d never experienced Zion in the snow before, I knew this would be a great opportunity to do so. After a bit of deliberation and talking with one of my photographer friends in Utah, I decided to change my plan and visit Utah’s National Parks instead of Death Valley on this trip, to take advantage of the recent snowfall conditions. As a landscape photographer, I often have to make my trip plans at the last minute and adapt quickly to changing weather conditions, in order to be in the right place at the right time to make images that capture ephemeral conditions. I am so glad that I did change my plan for this trip, as experiencing this wonderful place in the snow is a completely different experience from the fall trip I’d made just a month prior. To make the photographs for this trip, I brought only my 2nd-generation Intrepid 4x5 Field Camera, two lenses, and a large supply of over over 90 sheets of film, most of which I did not end up needing. Arriving in the park, I found that the park was overrun with tourists on the roads, but that the tourists did not camp or hike much, so as soon as I entered the campground I found it quite quiet and peaceful. It turns out most people don’t like to sleep outdoors when it is 22F (-10C) outside! I also found most of my favorite hiking areas to be almost completely free of other people, which made for a very peaceful experience on this trip. The roads were icy, and my 4x4 even fishtailed a few times on the black ice. When I went hiking, I used Micro Spikes (like ultra lightweight crampons) to increase traction, along with knee-high gaiters to keep the snow out of my shoes. I used foot warmers to keep my toes warm in the frigid temperatures when hiking in deep snow all day, which worked very well. This is the very first image I made upon arriving in Zion. As I drove along the road in the high elevation areas of the park, I spotted an area that looked promising and decided to put on my winter hiking gear and explore it in detail on foot. 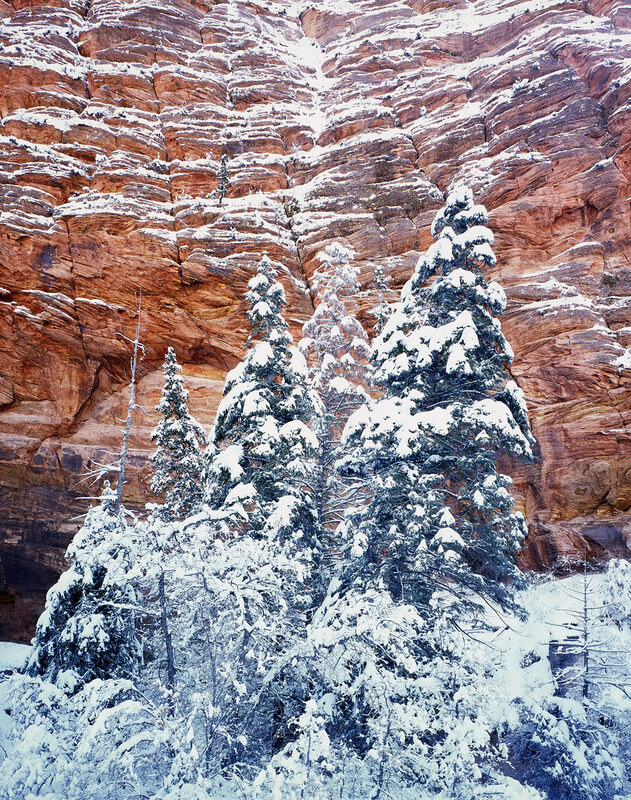 This stand of Pines cloaked in the icy veil of winter formed a striking contrast against the vivid orange sandstone canyon wall in the background. Snow had accumulated on the cliff ledges, forming alternating stripes of orange and white, with the blue sky subtly reflected in the white snow on the evergreens rounding out the color palette. To get a sense of scale, look at the tree growing on the wall in the left center of the frame, above the 2nd Pine tree. That tree is about the same size as the trees in the foreground - about 40 feet tall! That tree is a marvel in itself, growing out of almost nothing on the narrow cliff ledge. The wall is hundreds of feet tall and is at least a hundred plus feet behind the trees. I am standing about 3 feet away from the trees on a hillside, standing in about a foot of fresh powder. This place is truly magical in winter! Zion is always filled with beautiful juxtapositions, and winter brings out a whole new set variety of these combinations of texture and tone. In this scene, a snow covered evergreen tree is juxtaposed against a brilliant red sandstone wall forming a beautiful palette of reds, greens, grays and whites that evokes the feeling of Christmas. The tree arrested my attention almost immediately, and I stared at it and walked around it several times from a careful distance, trying to get a feel for the best angle without making my footprints ruin the pristine nature of the place. The elements in this scene probably appear to be close together, but that sandstone cliff in the background is in reality about 100+ feet (30 meters) behind the tree and over a hundred feet tall. I am about 30 feet (10 meters) away from the tree. Almost imperceptible in the image are a set of bighorn sheep tracks in the foreground. Later on in the trip, I explored some of the backcountry washes that I’d photographed in the autumn season. 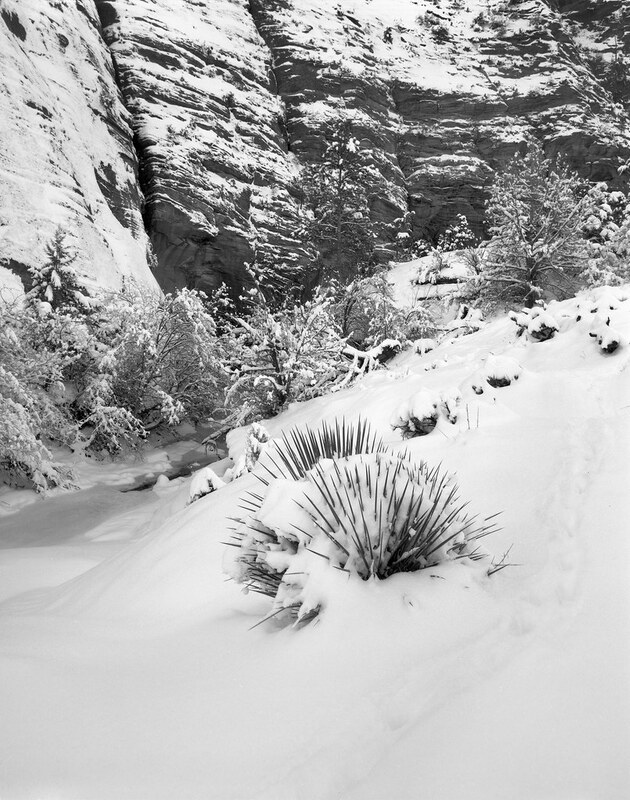 Zion's backcountry washes take on an entirely different character in winter, and one of my favorite things to see was how the snow blanketed the various desert flora. 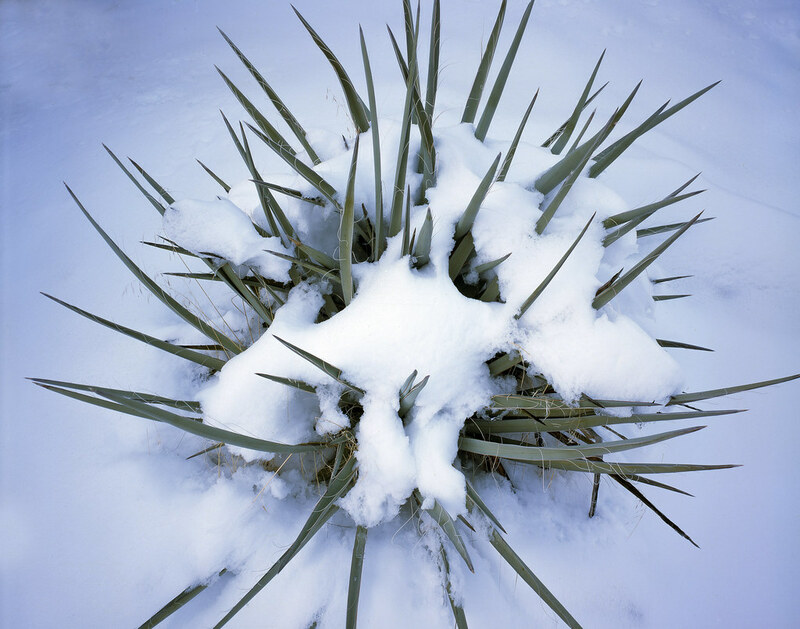 The Yucca plants covered in snow, in particular, were really bizarre and fascinating to behold. This scene captures an ephemeral moment when a group of maples and cottonwoods in this wash were covered in a fresh coat of deep powder. The snow-buried Yucca made for a striking foreground element, and if you look closely, you’ll notice a set of bighorn sheep tracks leading through the deep snow around the Yucca on the bottom right of the frame. I made two exposures of this scene, a black and white negative on Fujifilm Acros 100, and a color transparency on Fuji Provia 100F. I think I prefer the color version personally, now that I see them both side by side. I shot a lot of doubles on this trip, both for redundancy and for artistic options. This is also a great way to learn which film stocks you prefer, by exposing them side-by-side to the same scene at the same time. By doing this, you will quickly learn how each film renders the tonality and details of each type of scene, and become better at selecting the ideal film for the each image you want to make. I love the way the slide film renders the shadows in an icy blue, which nicely complements the reds of the desert sandstone and the subtle greens in the Yucca. This is the black and white version of the above scene, which I captured on Fuji Acros 100. 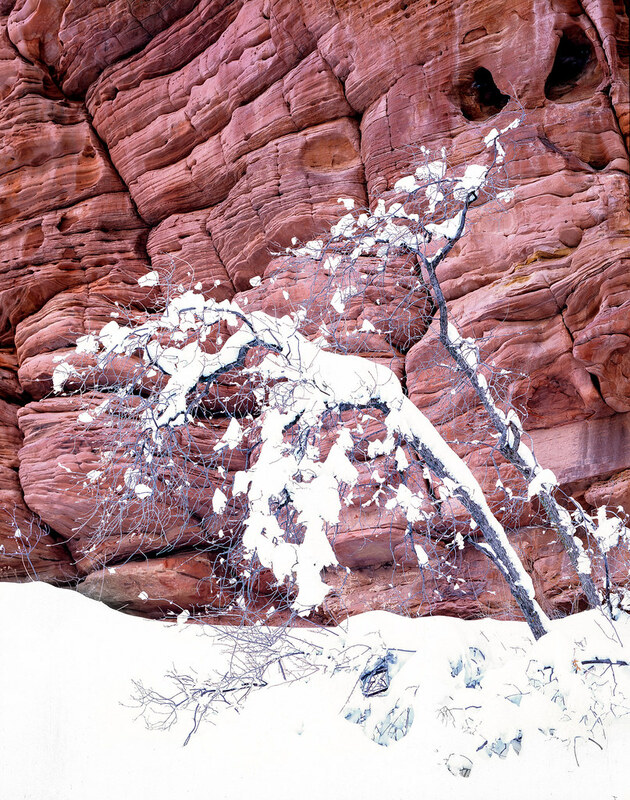 I admire the way this film renders the red sandstone a dark charcoal gray and creates a strong contrast with the dark rocks and light snow. Acros has very fine grain structure, which results in gorgeous detail rendition & tonality. Acros is getting harder to find, and is one of the more expensive black and white films. If you cannot find Acros, Kodak TMax 100 has been described by some photographers as a cheaper and more readily available competitor to Acros with similar characteristics. Sometimes a scene features rich contrast or detail, but a muted color palette, or a color palette which distracts the eye from your intended subject. Other times, color can create problems with visual balance, if it occurs where it is not needed compositionally. In these cases, it can be best to make a black and white exposure. Another thing I like black and white film for is creating a more abstract or “drawing-like” version of a scene, which can sometimes be more emotionally engaging than a color photograph, because it triggers the imagination by allowing the mind to visualize colors on its own, or leave them out entirely to simply focus on texture and contrast. There are many photographers, especially in large format, who only make black and white images. While I respect this dedication, as an artist I personally like to select either black and white or color film based on the subject and my artistic vision for the scene. Some scenes will work equally well with either, and in those cases I may shoot one of each, as I did with several scenes on this trip. 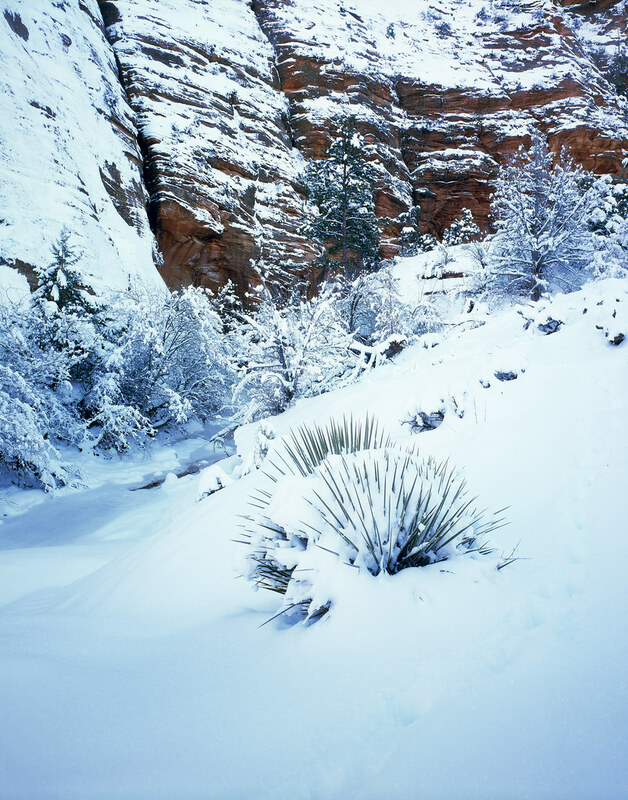 As I hiked through the deep, fresh powder in Zion’s high country washes looking for compositions, I couldn’t help but continually notice how beautifully striking the desert plants looked under a delicate blanket of snow. It seemed so out of place to see things like slot canyons, Yuccas, Junipers, Piñon Pines and other desert denizens in such a wintery context. One of my earlier compositions featured one of these spiny Yuccas buried in snow as a foreground element. As I hiked back out to my truck, I came across this beautiful Yucca plant buried in snow on a small hillside which made for a nice composition surrounded by snow. It was tricky to get the whole Yucca in the frame and no other distracting elements. I extended my tripod quite high and looked up onto the ground glass to focus, using my 90mm wide-angle lens to get the whole plant in the frame. I made the exposure on Fuji Provia 100F to get the subtle blues of the blue hour sky reflected in the snow along with the soft greens of the Yucca. I like the way it rendered the scene. This was a relaxing and meditative image to scan and process, and I greatly enjoyed staring at it for a long time. I think it would make a very nice print for a relaxing room. Scenes like this often thrive on large format film, as the subtle tones and fine details captured by large format film can bring out the quiet and delicate nuances of an intimate scene like this in a way that is unparalleled by other mediums. This subtlety can be appreciated to a much greater extent in print. This is the same scene as my autumn Zion trip image with the yellow cottonwood on the left and red maple on the right in the slot canyon, but you'd hardly recognize it in winter! On my winter trip, I trekked out to this scene to see what it would look like in the snow, and found the trek significantly more difficult than it was in autumn! In place of a dry wash was a flowing stream. About a foot of fresh powder snow covered the ground, and a thin layer of ice covered most of the wash, veiling several inches of icy water beneath. As I hiked in, I was able to walk gingerly on the ice and stay in the middle of the narrow wash and canyons. However on the way out, the ice had softened and would no longer support my weight, so it was a game of hop-scotch to try and hop and leap from one boulder and thin patch of remaining hard ice to another in order to make it out safe and dry. 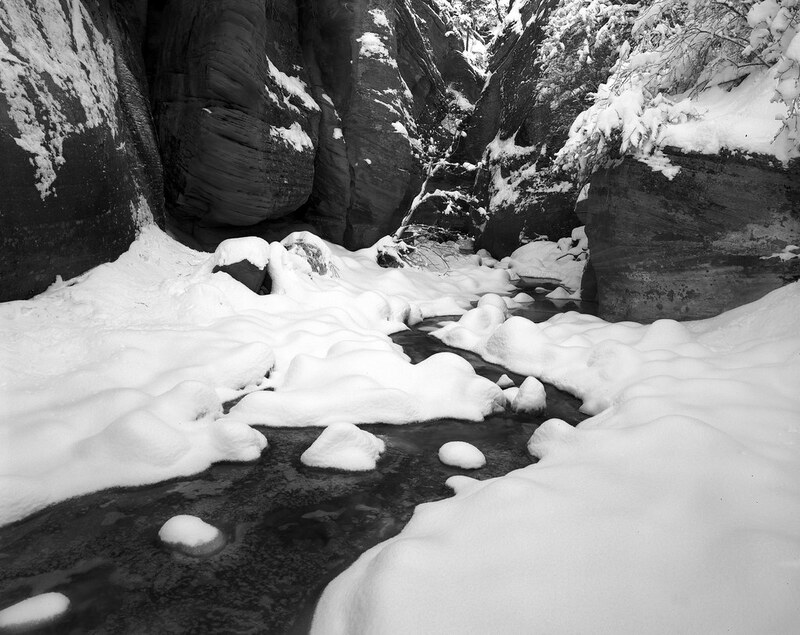 Because this scene only included red sandstone and white snow, I decided to photograph it on Fujifilm Acros 100 black and white negative film to emphasize the S-curve in the stream making its way through the ice into the narrow slot canyon. 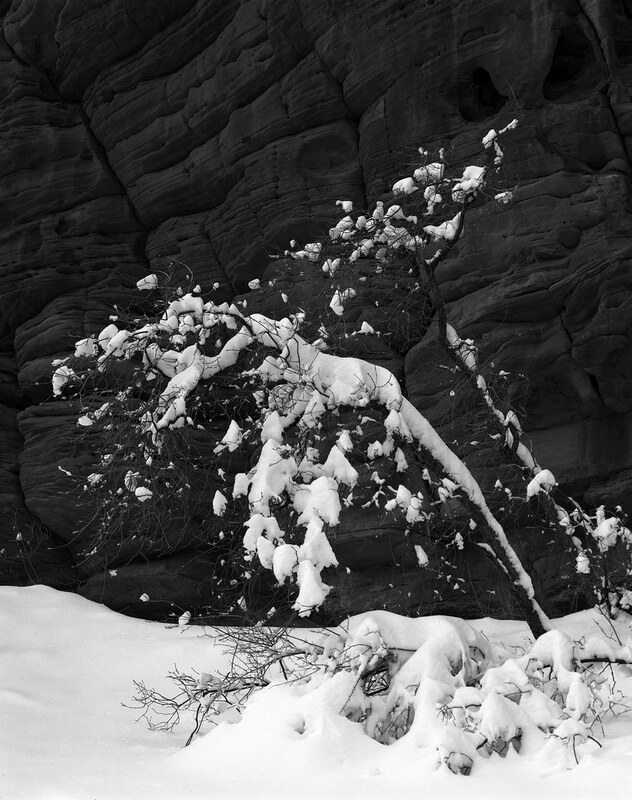 You can see the skeleton of the cottonwood tree from my earlier image on the left in the canyon opening, and the snow-burdened maple draping down into the canyon from the right side. Fujifilm NPS 160, expired 12/2003. This image is one of my favorites from this trip. I feel it brings together the aspects I love about large format film. The dynamic range of the image is quite extreme, with everything from snow in full sunlight to tree bark in full shadow, to a silhouetted tree with incredible shadow detail. I love the subtle blues reflected from the blue sky above showing in the shaded snow in the foreground, contrasted against the warm orange tones of the iron-rich erosion soil on the hill in the background. Every pixel of the image is razor sharp and in perfect focus, and the color palette is perfectly natural without overemphasizing any one element. On a technical level, this image was made possible by a combination of large format color negative film, a graduated neutral density filter, and very careful metering. The subject is a Cottonwood tree silhouetted against the adjacent bank of the Virgin River in Zion Canyon. This scene only existed for a matter of minutes, as a few minutes before this exposure the entire scene was in full shade, including the background, and a few minutes after, the tree and foreground were in full blinding sunlight. Had I returned a few days later, much of the snow in the scene would have been melted away by the afternoon sun. The image was made possible by two things: a soft-edge 2-stop ND graduated filter, and color negative film. Color negative film has an incredibly wide dynamic range, so it can handle a very big difference in brightness between shadows and highlights. The neutral density filter had the effect of dialing down the highlights in the background and brightening the snow in the foreground to further balance the image. I used a batch of expired Fujifilm NPS 160 from 2003 that I found on eBay. It can be fun to experiment with expired films, as they can often be found for great deals online and sometimes produce different aesthetic results from current production films. I was pleasantly surprised and impressed by this film. It produced the best results of the entire trip, and it seemed to be perfectly exposed in all the lighting conditions I could throw at it. It has an incredible latitude and a perfectly natural color palette with gentle contrast. It's sad that Fujifilm discontinued this amazing film. I wish they would take a cue from Kodak and re-release it! Fortunately, if you like the overall look and dynamic range of Fuji NPS, Kodak’s Portra 160 is a direct competitor that is in current production and readily available. Towards the end of the Zion portion of my trip, as I explored a familiar canyon in the high country, I came across these two maples completely covered in a thick blanket of fresh snow. The snow was so deep in this spot that I had to set my backpack in over a foot of powder and carefully extract each item of my camera gear one at a time without dropping anything into the deep white fluff, lest it disappear into the snowy abyss. I love the delicate nature of the Maples paired with the elegant purity of the snow, and the vivid red of the canyon wall really creates a strong contrast which isolates the trees. I’d visited these two trees only a month prior and found them covered in vivid red leaves at that time. It is amazing to experience these special places during different seasons and see how the season completely transforms them, creating a starkly different atmosphere during each distinct time of year. In the winter, the rugged yet delicate landscape seems to be in a deep slumber under a thick blanket of pure white. This exposure was made about 5 minutes after the previous image. This black and white negative film version was made using Fuji Neopan Acros 100. I love the inky blacks and silky whites that the Acros renders, and I think they are a great fit for the snowy scene. Between the color and black and white versions of this image, I personally prefer the black and white version, and am currently working on preparing to make a carbon-transfer process print of this image, which I think should make a good fit for both the scene and the medium. After leaving Zion National Park, I was thinking of heading down to Death Valley. But Bryce Canyon had a coat of snow, and was less than two hours away. I'd never been to Bryce before, and seeing it in winter had been on my bucket list for years, so I decided to go. Timing the weather forecast was essential, as the temperatures had been absolutely frigid, with nighttime lows hanging at double digits below zero. Camping in the cold wasn't as big of a deal as I'd thought it would be, as I sleep inside the back of my 4x4 SUV and have three 28F sleeping bags that I layer inside one another for added insulation, plus a small tent-safe propane heater, which I didn't end up needing. I'm not usually a sentimental person, but this is an image I made for sentimental reasons, in a way. As a kid, I grew up in the Northeastern United States. 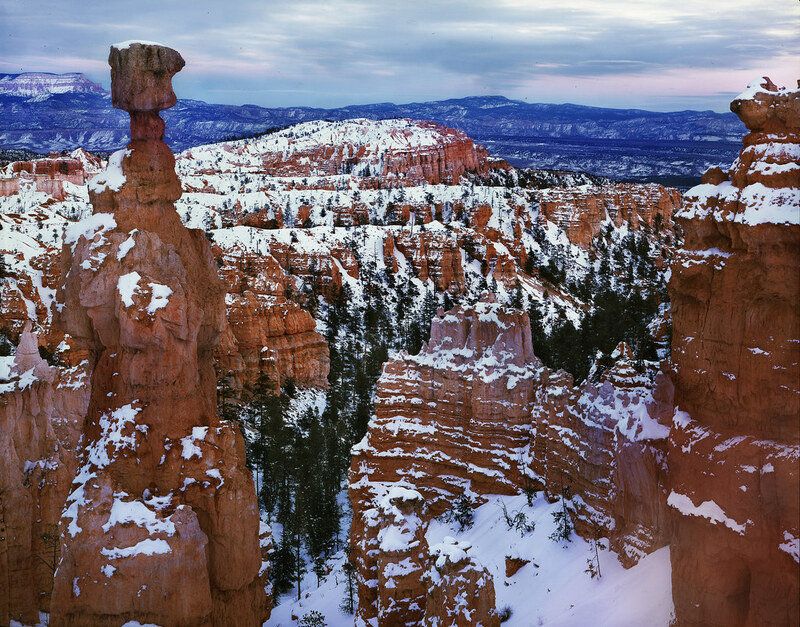 A large photographic print of the Thor's Hammer sandstone Hoodoo formation in Bryce Canyon National Park graced my parents' living room wall. Seeing it every day, it made its way into the depths of my mind. I never knew where this beautiful place was, but it sure didn't look anything like the green rolling hills of deciduous trees of Upstate New York. Compared to the area where I grew up, this place may as well have been on the surface of Mars. It sure looked like Mars, with its alien red rock formations jutting out of the earth and shooting skyward in bizarre pinnacles of stone! Much later, I became a landscape photographer and soon enough learned of Thor's Hammer in Bryce Canyon National Park. 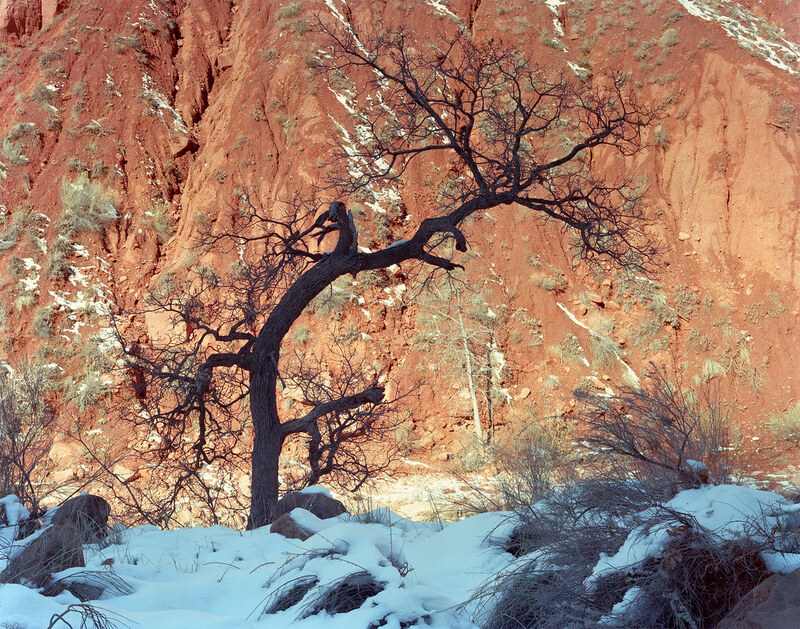 Over time, I saw more and more images from this strange place, and of all the images I saw, those made in winter after a fresh snowfall stood out to me the most, as the white snow on the red cliffs and hoodoos made for a striking juxtaposition of soft and hard, dark and light, smooth and rough, warm and cold. The snow rendered this magical place even more so. And so the idea of visiting Bryce Canyon National Park in winter after a snowstorm entered my mind and made its way to the bucket list. On this trip, I finally crossed that item off my list, and experienced camping, photographing and hiking in this bizarre and otherworldly place in winter, after a snowstorm. It was just as magical as I envisioned it, and now instead of an imagination, I have a memory… and some images to preserve it. To see more of my work and stay appraised of future trip reports, videos and images, you should follow me on Instagram at @lowerylandscapes, on Facebook, and on my blog and email newsletter at http://lowerylandscapes.com. You can also find me on Flickr, and on 500px.